Hey, look at that GTO! The words hadn't left my mouth when I spotted the large "N" and "O" on the Pontiac's windshield. 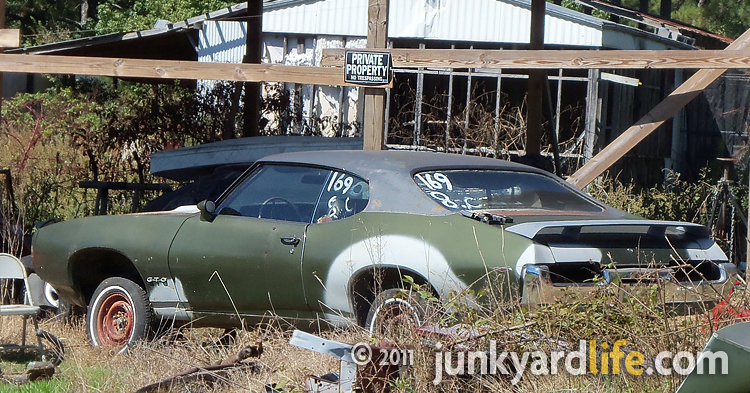 Two of the fiercest muscle car era Pontiac GTOs, a 1967 (above) and a 1969 (below), sparkled like emeralds along the back roads of Rainbow City, Alabama. I jammed on the brakes and rubbernecked like mad for a few seconds. 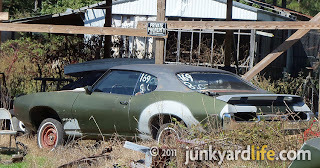 GTOs of this vintage are seldom seen parked in the weeds in front yards anymore. I had to get a closer look. I made a quick U-turn to check out the potent Ponchos. I did a double take then laughed out loud when I saw the answer to the question in my head. It was evident that this outspoken 1967 Goat, in good condition, has garnered more than a few knocks on the door at the rural farmhouse. The home owner's dog, chained to a stake near the front door, barked mercilessly as I pulled in and turned my Jeep around in his gravel driveway. All across the property, General Motors vehicles were scattered about in every direction. These two GTOs were the pick of the litter. 1969 Pontiac GTO sporting a Judge spoiler on blocks in an Alabama front yard. Despite my desire to ask about the multitude of cars I turned around and left. The owner, who has every right to peace and quiet, said a mouthful with those two little letters. "No." No need for me to knock. No need for me to ask the same tiresome questions. The "No" GTO said a mouthful. The message was received without having to stare at the face of someone who doesn't want to be bothered. Perhaps a few people could learn something from this Pontiac's windshield. 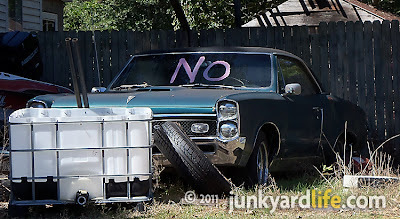 I say "NO" to hoarders like this who allow nice cars such as these to rot away on their lawn and refuse to let them go! "NO" is put on at the junk yard, for not to crush. Normally when the yard is closing, and selling everything for scrap. You should stop by and ask.